Create a minimal, natural capsule skincare collection for 2016, with this handy guide! If I’m there it’s because I’ve run out of something and I’m desperate, a.k.a: it’s a million degrees outside and I’m all out of natural deodorant. While the pharmacy beauty aisle is convenient, I can’t help but feel that I end up walking out with products that I didn’t want to buy. Buying without clarity doesn’t match my values of living an intentional life, where I feel good about my choices and inspired by the things that I surround myself with. So, my goal with this scene was simple – how do I avoid the need for unplanned, unwanted shopping trips, that inevitably lead to a cabinet full of products I don’t love? For me, it was a process that started with a question: why? Why do I want to choose what I put onto my skin and use for my family? Why do I want to care about what I support with my money? Why do I want to take the time to discover natural brands? Why does natural beauty matter to me? With these questions, I noticed that as I became more clear about my values and the things that I buy and use – the clutter in my cabinets began to clear up too. Instead of running out of something and impulse shopping – I found myself planning ahead and creating a capsule collection of products that make feel good. I adore walking into my bathroom and seeing a minimal collection of beauty products that speak my values, nourish my skin and make me feel beautiful! It’s a process, and it’s not something that needs to be rushed – but I do want to help you get control of your beauty routine and simplify. 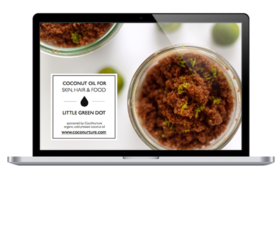 The Little Green Dot Natural Beauty Shopping Guide will help you! Inside you’ll find 36 of the most fabulous eco-skincare makers who create with heart, skill and integrity. Plus, you’ll even get to read natural beauty tips, straight from the makers behind the brands. First, think about your skincare collection. What products do you use – which are ones you can make and which are ones that you’d love to find a natural option for? Write it all out, like a shopping list (cleanser, toner, moisturiser, sunblock, deodorant) and then use the guide to find those products. That way you’re not shopping out of impulse, but through thoughtful research. 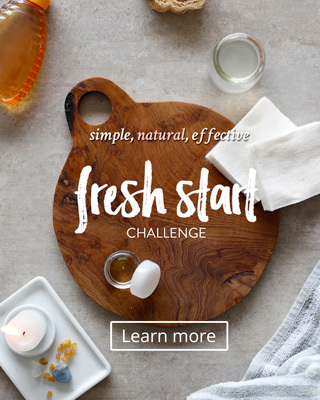 You’ll be creating a simple Natural Beauty skincare collection that can proudly sit on your bathroom counter. Nothing gets shoved, crammed or forgotten in the back of some drawer! And then, you can repeat this buying process for the change of seasons or as your skin’s needs change. Get the guide. It’s free, but you’ll feel like a million bucks every time you get ready in the morning and see the beautiful, meaningful things that you surround yourself with.